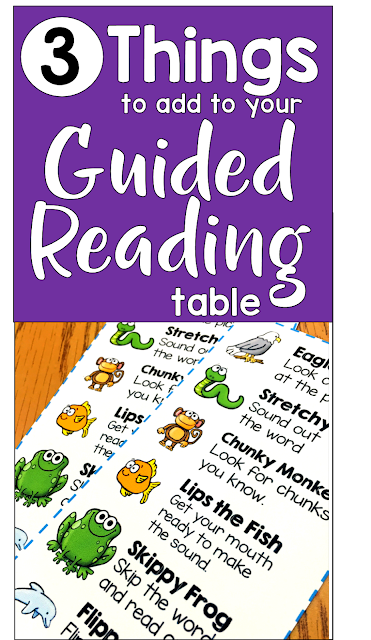 Guided reading is an essential part of your reading time. However, it is usually a small chunk of time each day, so you need to make the most of it and engage your students during guided reading. So how do you do that? I am going to share with you 3 things you should have at your guided reading table to make your time run smoothly and to help keep your students engaged during guided reading instruction. What is at my Guided Reading Table? First grade readers are decoders in their purest form. They have learned that to read they need to sound words out. Once they have learned their letter sounds they are good to go, or so they think. If you ask a first grader how to solve an unknown word they will say “sound it out” every time. We need to teach them that there are lots of other ways to figure out difficult words. I do this by introducing them to the decoding strategies and the stuffed animals that go with each. 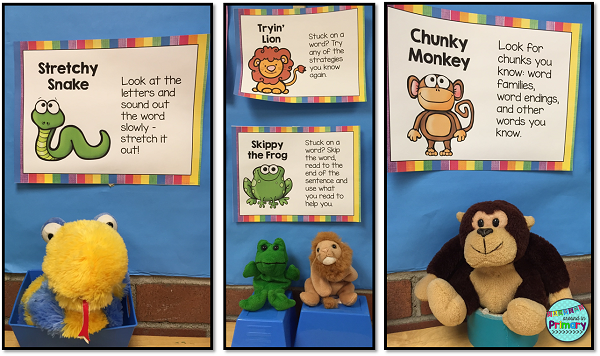 I created a set of Decoding Strategies Posters with animals to teach each strategy. They are immediately hooked when the stuffed animals come down to the reading table as I model how to use a strategy. For instance, when I introduce stretchy snake, we actually take turns coiling him up and stretching him out as we stretch out words. 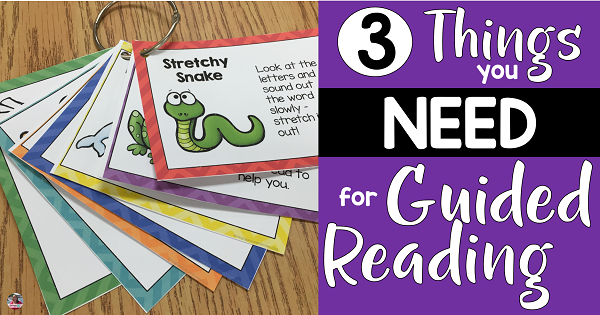 However, it is not practical to keep stretchy snake there at all times, so I created a few student tools to go with the posters on the wall behind our guided reading table. When we are working on a particular strategy, I give students the decoding wand with the character on it. Click on the wands or the bookmark photo below to take a closer look at the resource. This acts as a reference to try that strategy when they come to an unknown word. 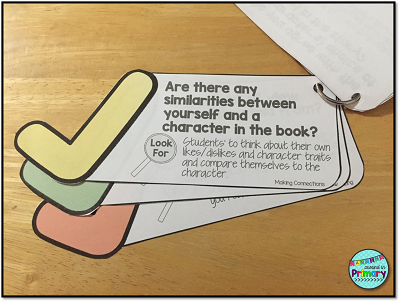 Later on, students can use a bookmark, which includes all the strategies, when they are more confident readers and have learned some strategies to try when decoding. 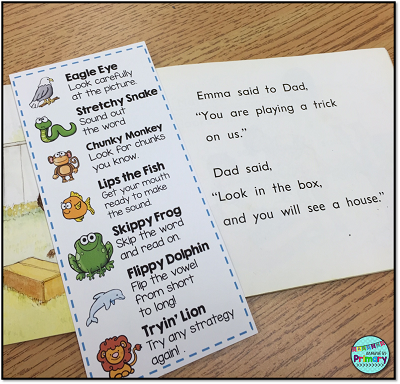 I teach the decoding strategies in approximately the same order every year ~ Eagle Eye, Stretchy Snake, Chunky Monkey, Lips the Fish, Skippy Frog, Flippy the Dolphin and lastly Tryin' Lion. When it comes to teaching comprehension skills, I have a confession to make. Many times I struggled to figure out what exactly to ask my students or how to word it. We do not use a particular reading series, so I glean resources from many places. 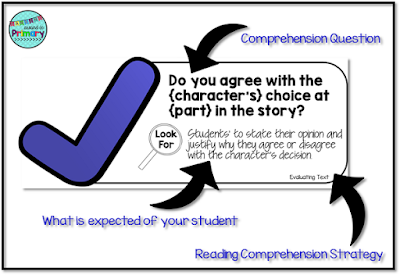 Identifying key comprehension questions for text was sometimes a bit difficult. That is why I decided to make myself a go-to resource for any non-fiction text, that covered all the different comprehension strategies that I teach. Enter Comprehension Checks! 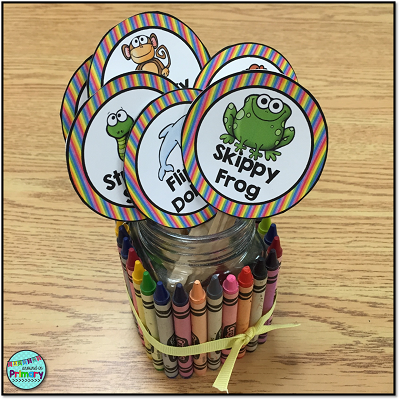 These question cards are placed on a ring, and I keep them at my guided reading table and another set at our carpet area to use during shared reading. 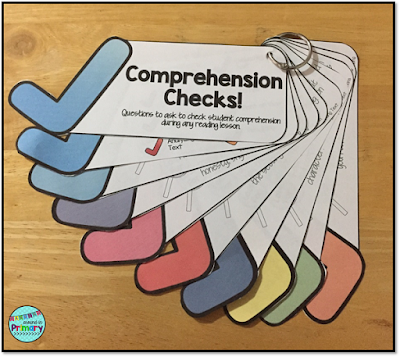 The Comprehension Checks are colour coded and organized by reading strategy. There are multiple questions for each strategy. On each card you will find the question and then “look fors” – what you might expect your students to say or think to answer the question. This extra information makes the cards more teacher friendly. This tool isn't necessarily aimed at teaching during guided reading, but it is an essential precursor to be able to teach reading. In first grade, at the beginning of the year, not all of your students will be ready for a traditional guided reading group. 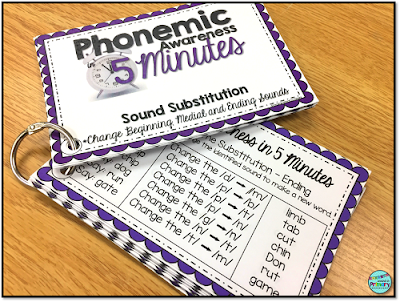 Instead, they need to develop foundational phonemic awareness skills so that they can begin to decode and read the text. In this case, teachers do not need to provide their students with books and questions, but rather they need to be armed with word lists and lots of them. I always start the year with at least a couple of groups who need to start here, and I wanted to keep them engaged too during their instruction. 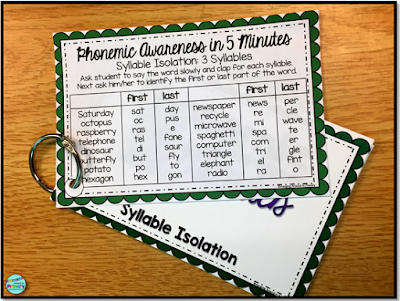 I created a set of word lists to use to practice whatever phonemic awareness skill I was working on. 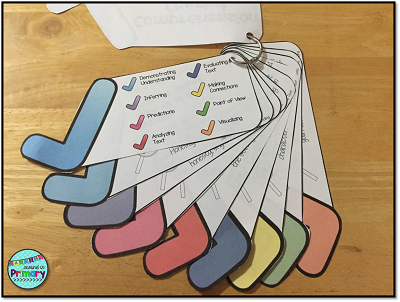 I pull out the color-coded sets and have several different word lists for each skill, so I wasn't trying to generate word lists on the fly. We have all done that! 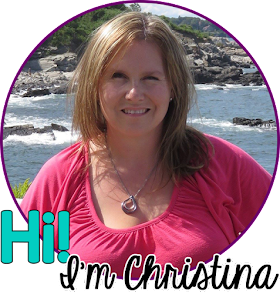 I hope you have found some new resources to make your guided reading time more effective and to help engage your students during guided reading instruction. Take a moment to pin this post so you can come back to it.